SpaceX has been providing a seemingly endless stream of publicity lately. After months of rocket testing and sending payloads to the International Space Station, they are now unveiling the latest in some pretty impressive designs. This included the SuperDraco, a new attitude-control thruster; and the new Dragon V2 – a larger, more powerful, and manned version of the reusable Dragon capsule. These unveilings came within a short space of each other, largely because these two developments will be working together. The first unveiling began back in February, when SpaceX announced the successful qualification testing of its SuperDraco rocket engine. Designed to replace the Draco engines used for attitude control on the Dragon orbital spacecraft, the SuperDraco will act as the Dragon’s launch emergency escape system, as well as giving it the ability to make a powered landings. Since that time, the company has announced that it will be added to the new Dragon capsule, which was unveiled just days ago. The SuperDraco differs from most rocket engines in that its combustion chamber is 3D printed by direct metal laser sintering (DMLS), where complex metal structures are printed by using a laser to build the object out of metal powders one thin layer at a time. 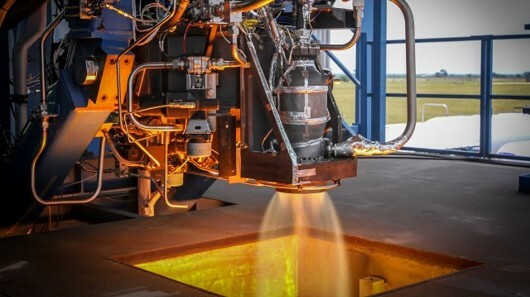 The regeneratively-cooled combustion chamber is made of inconel; a family of nickel-chromium alloy that’s notable for its high strength and toughness, and is also used in the Falcon 9’s Merlin engine. Through 3D printing, robust and high-performing engine parts can be created at a fraction of the cost and time of traditional manufacturing methods. SpaceX is pushing the boundaries of what additive manufacturing can do in the 21st century, ultimately making our vehicles more efficient, reliable and robust than ever before. Other notable features include the propellent, which is a pair of non-cryogenic liquids – monomethyl hydrazine for the fuel and nitrogen tetroxide for the oxidizer. These are hypergolic, meaning that they ignite on contact with one another, which helps the SuperDraco to restart multiple times. It’s also built to be deep throttled, and can go from ignition to full throttle in 100 ms. But what really sets the SuperDraco apart is that is has 200 times the power of the Draco engine, which works out to 7,440 kg (16,400 lbs) of thrust. The SuperDraco’s main purpose is to provide attitude control for the Dragon capsule in orbit and during reentry, as well as acting as the craft’s launch escape system. Unlike previous US manned space capsules of the 1960s and ‘70s, the next version of the Dragon won’t use a tower equipped with rocket motors to carry the capsule away in case of a launch accident. The SuperDraco can be used at any point in the launch from pad to orbit, not just during the first minutes of launch, as the towers were. Eight engines firing for five seconds are enough to carry the capsule safely away from the booster with 120,000 lb of axial thrust. In addition, the eight engines also provide a high degree of redundancy should one or more engines fail. 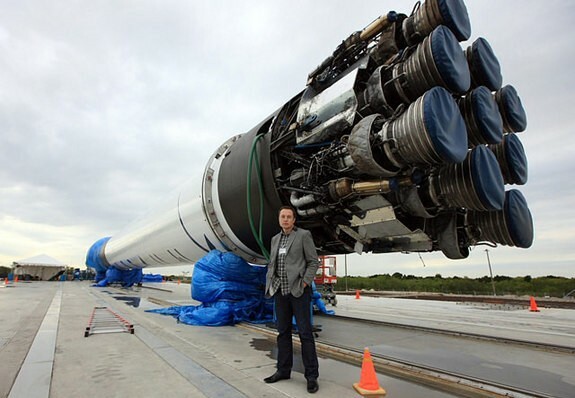 But what’s really ambitious about the SuperDraco is that, like the Falcon 9 booster, the Dragon is designed to ultimately return to its spaceport under its own power and land with the precision of a helicopter, and it’s the power and control of the SuperDraco that makes this possible. SpaceX is even looking beyond that by planning to use the SuperDraco engine for its Red Dragon Mars lander; an unmanned modification of the Dragon designed for exploring the Red Planet. The SuperDraco will make its first flight on a pad abort test later this year as part of NASA’s Commercial Crew Integrated Capabilities (CCiCap) initiative. Using 3D printing to cut the cost of production is in keeping with Musk’s vision of reducing the associated costs of spaceflight and putting rockets into orbit. But equally impressive was the unveiling of the Dragon V2 manned space capsule, which took place at a brief media event at SpaceX’s Hawthorne, California headquarters at the end of May. This larger, more powerful version of the reusable Dragon capsule will one day carry astronauts to the International Space Station (ISS) and return to Earth to land under its own power. This latest development brings the company one step closer towards its ultimate goal of a fully reusable manned capsule capable of making a powered landing. Billed as a “step-change in spacecraft technology,” the Dragon V2 that Musk unveiled is larger and more streamlined than the first Dragon, with a cabin large enough to accommodate up to seven astronauts for several days in orbit comfortably. The interior is outfitted with touchscreen control panels and a more sophisticated piloting system, so it can dock with the space station autonomously or under the control of the pilot instead of relying on one of the ISS’s robotic arms. For returning to Earth, the Dragon V2 has the third version of the PICA-X heatshield, which is SpaceX’s improvement on NASA’s Phenolic Impregnated Carbon Ablator (PICA) heat shield. Another nod to reusability, this shield is about to carry out more flights before needing a refit since it ablates less than previous versions. And of course, the capsule will be outfitted with eight SuperDraco engines, which give it a combined thrust of almost 60,000 kgs (131,200 lbs). 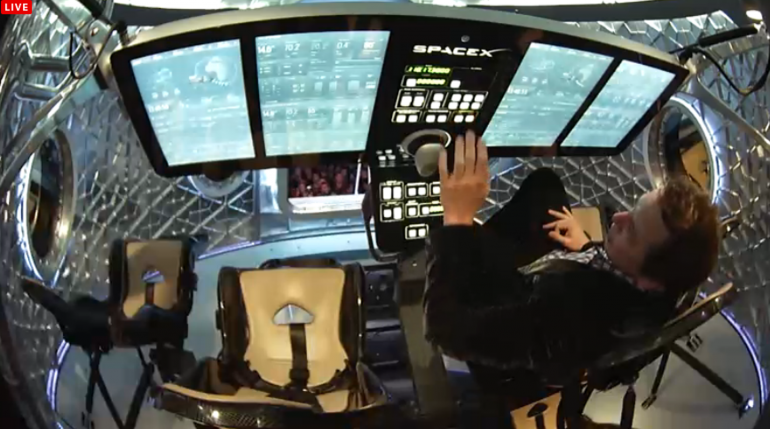 However, Musk points out that Dragon V2 still carries a parachute, but that’s only a backup system, similar to the analog joystick and manual controls that are available in the cockpit. Like these, the parachute is only meant for use in the event of a malfunction of the SuperDraco engines, which can still make a landing if two of the eight engines fail. If the landing is successful, Musk says that all the Dragon V2 needs to fly again is refueling. And the arrival of these new machines couldn’t have been more timely, given the termination of NASA’s cooperation with Roscosmos – Russia’s federal space agency. With reusable craft that are produced by the US and that can be launched from US soil, Russia’s aging Soyuz rockets will no longer be necessary. So much for the trampoline idea! And of course, there are videos of the rocket test and the unveiling. Enjoy!